Are you looking for a mess free creative play resource? Something which is fun for all the family? We were recently sent some Playfoam to review by Learning Resources. As soon as I knew we were to review the Playfoam I was excited. I knew it would be fun and Maxwell and I would enjoy playing with it together. 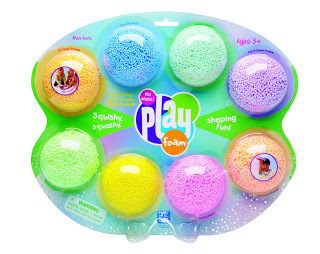 We received a pack of Play Foam which contained eight different colours. Four plain and four glittery sets of foam. At first the foam reminded me of the small polystyrene balls you can find in bean bags and I was worried that it may cause a mess all over the carpets but after playing with it we soon found this was not the case. The balls all stuck together and the foam retained its shape. I sat Maxwell in his highchair and gave him the Playfoam to investigate. I did not want him to mash all the colours up so I gave him just 2 colours to play with. Maxwell did not mix the colours together but instead he sat quietly and started to try to build shapes out of the foam. The Playfoam is easy to mould and I enjoyed creating Mummy and Max and our little house which you can originally see in our header. I was happy to see that the foam did not stick to our clothes, hands and carpet. It is a mess free creative play resource. The product is aimed at children aged 3 and above and although Maxwell is younger than this he still enjoyed playing with it. I believe this product is for the young and the old and it can help create hours of fun for all the family at weekends, after school or on wet play days. We used the play foam over a few weeks. I found the Playfoam did not dry out. The Playfoam is priced at just £9 which in my eyes makes it great value for money. You are able to use it over and over again. Playfoam offers a non-toxic formula which makes it safe for youngsters to play with. The only negative thing I have to say about the Playfoam is that we found it hard to store. When we originally got the Playfoam it sat in its plastic wrapper however unfortunately the packaging had to go in the bin as it got scruffy so we have been putting the foam in small plastic lunch boxes to keep it safe. 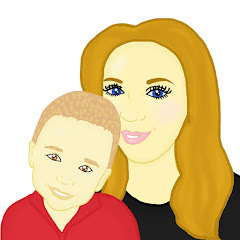 If you have enjoyed reading our review you can enter to win a set of foam for your family thanks to Learning Resources. There are 5 packs up for grabs. You can enter their competition on their Facebook Page. The competition ends 7th June. Love this, going to have to look for some to buy!